The crisp autumn air, colorful foliage, the soft crunch of fallen leaves. As Zion heads into fall, it’s time to get in your last tent camping trips for the year. Yes, you can camp in Zion well into October. While nights are crisp, days are fairly warm and the weather is great for hiking, outdoor activities and adventures. Autumn in southern Utah is usually a good time of year to hike the Narrows (barring flash flood warnings). Photography is at its best and most vibrant, and wildlife can often be spotted. Besides the striking reds, yellows and golds, there are fewer crowds in Zion National Park in fall. That means less competition for trail time and for viewing the unparalleled vistas which are even more breathtaking when fall colors are in full glory. Keep in mind that elevations within Zion National Park vary between 4,000 and 9,000 feet, and Zion Ponderosa is at 6,000 feet. In addition to temperature variances, the elevation changes also mean different areas of the park and Zion Ponderosa will experience peak foliage at different times. Many visitors are finding late October to be the peak season for leaves in full color, and for camping solitude. 1. Dress in layers. While this is a good tip any time of year, it’s essential in keeping you dry and comfortable during fall camping. 2. Eat warm meals. Granola bars a great to eat on the trail, but a hearty meal can go a long way toward fueling your body and your mind during fall camping. Fire up your camp stove, or check out the hearty menu at our on-site restaurant, now open year-round. 3. Keep moving. Find plenty of activities to keep you busy throughout the day. If you’re fall camping in Zion, you’re in luck, because this is a great time of year for hiking and other outdoor adventures. Don’t forget to check out the hike to Observation Point across Zion Ponderosa property, or hike to Zion National Park from the top down. 4. Campfires. Fall typically means fire restrictions have been lifted, so bring on the s’mores! 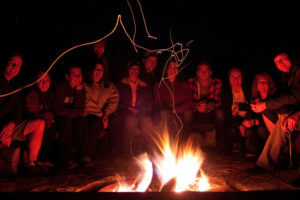 Be sure to check with East Zion Campground’s front office prior to starting campfires. 5. Don’t wait until you feel chilly to warm up. Pack an appropriately rated sleeping bag, socks and hats. A mat or cot to keep you off the chilly ground can help you stay warm, too. Making a few modifications to your standard tent camping packing list can help you stay warm, dry and comfortable during fall camping in Zion. 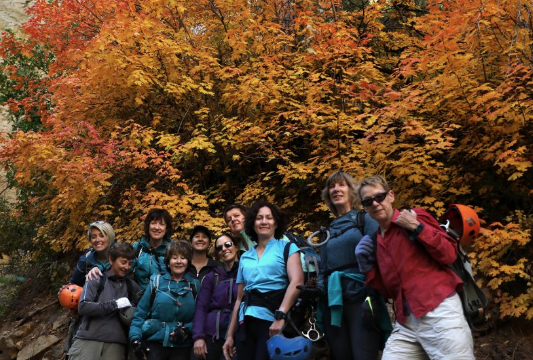 So grab your camera, pack your sleeping bag and tent, and get ready to enjoy nature’s most brilliant season in Zion. Check out our tips for what to wear camping and complete packing lists for tent camping.